This time last week, NHL teams were preparing for the start of the regular season in all the usual ways. Final cuts were being made. Last-minute contracts were being signed. Opening-night starting goalies were being named. And, in what’s become an annual tradition, we got one last flurry of moves on the waiver wire. Since the collective bargaining agreement dictates that some players can’t be sent to the minors without passing through waivers, the final days before the regular season always sees a bunch of last-minute attempts to sneak guys through. This year was no different, with a handful of players switching teams and many more passing through unclaimed. And that’s all well and good. But there used to be a better way. It ran from 1977 to 2003, and it was called the waiver draft. And it was great, because anything involving a draft is by definition going to be fun. The entry draft is fun; your fantasy hockey draft is fun; expansion drafts are just about the most fun thing ever. And the waiver draft was fun, too, which is presumably why it had to die. But for 27 years, hockey fans could look forward to an (almost) annual leaguewide draft of has-beens and never-weres, all held just a few days before the start of the regular season. And it was magic — a world of wasted picks, shady backroom deals, and “I didn’t know that guy was still playing” wonder. Let’s take a look back at some of the highlights. From the mid-’50s until 1975, the NHL had what it called the intra-league draft. It typically took place in June and was meant to promote competitive balance by forcing the league’s better teams to make some of their talent available to the bottom-feeders. Each team could protect a set number of players, with the rest being available to the rest of the league in a draft format, with picks going in reverse order of the standings. The intra-league draft was occasionally busy, but by the mid-’70s it had become an afterthought, largely due to a financial crisis brought on by the advent of the rival WHA. The draft was finally scrapped in 1976. But the need for something similar lingered, as the league’s competitive-balance issues only got worse. That was bad for the NHL, because nobody wants to buy tickets to watch cannon fodder, and bad for certain players, because depth guys on the top teams couldn’t get ice time. And so, in 1977, the waiver draft was born. Teams could protect 18 skaters and two goalies, with first-year pros exempted. Teams would draft in reverse order of the previous year’s standings, and would pay a fee for each player they took. The new draft didn’t exactly get off to a hot start; only three players were taken in 1977, none especially notable. The 1978 draft wasn’t much better, with only five selections, although the day was notable for a series of controversies surrounding the Canadiens. 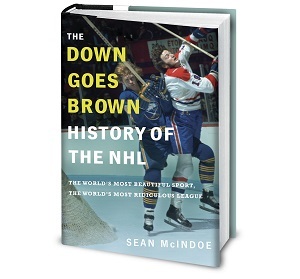 The reigning champs, in the middle of a four-year Cup streak, were accused of using loopholes to protect players, and also tried to work a sneaky trade-back deal involving the draft’s top pick, Pierre Bouchard, that was overruled by the league. The WHA merger wiped out the 1979 draft, but everyone agreed to give the whole thing another try in the ’80s, so long as the Habs would promise to stop screwing around. Over the course of the 1980s, the waiver draft went from a novelty that had been tried only a couple of times to a standard part of the hockey calendar, and NHL GMs got more comfortable with the format as the decade wore on. This was the era when we started to see some recognizable names showing up on the drafted list, although it was rarely because of what the player was accomplishing on the ice. For example, future Rangers coach and (after that) controversial head disciplinarian Colin Campbell was plucked in the 1980 draft, going from the Oilers to the Canucks, which made him a member of the presumably exclusive club of players to be picked in four different types of drafts: the NHL entry draft, the WHA amateur draft, an expansion draft, and a waiver draft. Boston’s John Wensink and Quebec’s Curt Brackenbury were taken that year, too, establishing what would eventually become a theme: teams using the waiver draft to replenish their enforcer ranks. Wensink was taken again in 1981, along with another future NHL head coach: Terry Murray, who went from one team he’d someday coach, the Flyers, to another, the Capitals. (Murray famously got the job in Washington in 1989-90 as a replacement for his fired brother, Bryan.) But the biggest names taken that year were two members of the Canadiens dynasty. Yvon Lambert was picked by the Sabres, while future Hall of Famer Serge Savard had his 15-year career in Montreal ended by a waiver-wire selection by the Jets; he’d play two years in Winnipeg before retiring. While those guys were all key picks in their own right, the undisputed MVP of the early-’80s waiver draft was winger Jeff Brubaker, who was taken four times in four drafts between 1981 and 1984, part of a nine-year NHL career that saw him play for seven teams, presumably because chanting “BRRRUUUUU” was so much fun. The 1984 draft also saw the Penguins use the first overall pick on former 50-goal scorer — and charter member of the NHL’s Brady Andersons club — Wayne Babych; needless to say, that would not end up being the most successful first overall draft pick the Pens used that year.